You have made your investment into your training and your practice to offer the best dentistry you can to your patients. Now it is time to let your target audience know that you have the dentistry they need and want. 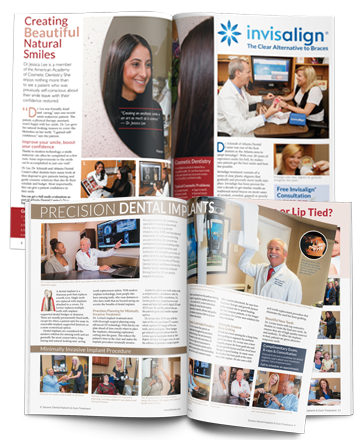 Our Custom Magazine Direct Mail Program provides a unique marketing platform to attract patients needing more extensive dental work as well as providing a good new patient flow. Each magazine is made exclusively for a practice and is distributed to its target audience via mail as well as other outlets. We include information on the doctor(s) and practice emphasizing their strengths, a full services listing, photo testimonials and before and after photos, as well as many other features that highlight the worth of your practice. Many of our clients have obtained their highest-production cases directly from our magazines. While our magazines are successful in driving in any type of patient to the practice, they are specifically designed to interest the person who needs extensive dental work. We also provide magazines focusing on only one or two services, such as dental implants, or, for a periodontist, dental implants and gum treatment. Our magazines are excellent standalone marketing pieces and provide many of our clients a large portion of the new patients they need for their preferred services. The magazines also work well in conjunction with our Internet Marketing Program. Our Print Distribution department does careful research into the demographics of each client’s geographic area. We use market research and other scientific marketing techniques to showcase your practice’s strengths and the services you most want to deliver. Each part of our program has been carefully researched, and now, with many magazines in circulation, proven to work. There are many elements that go into making our magazines successful, including how we write the copy, what we put on the front cover, which photos we take and how we use them, the design we use and more. These are based on research and scientific marketing methodology. 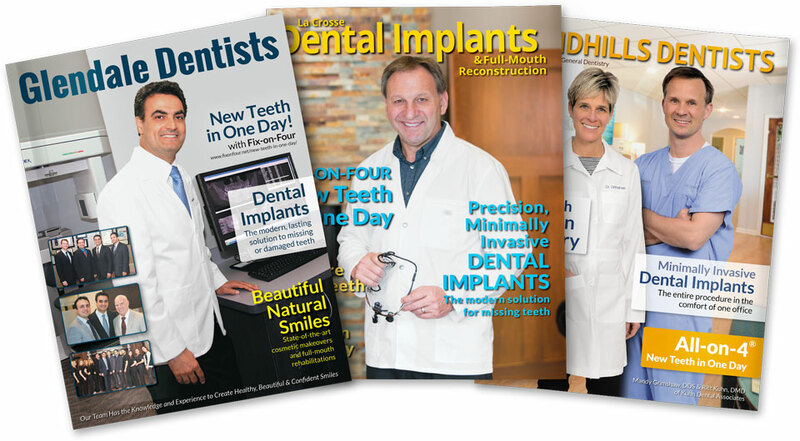 Each magazine is customized to you, your type of practice and your geographic location. We also carefully research the distribution of your magazines. We ensure they go to the right areas via mail, insert or placement in retail outlets. We track the response of our magazines so that we can adjust distribution as needed. Unlike postcards, brochures, coupons and flyers, our magazines have enough space and enough authority to properly introduce the reader to you and your practice. They get immediate response as well as over a period of months. 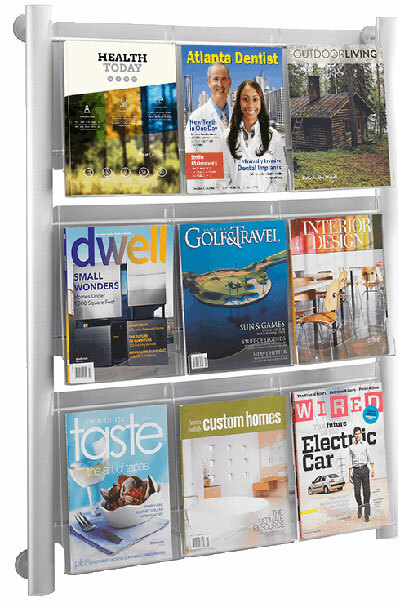 Prospective patients like to keep the magazine around until they are ready to get their dental treatment. By proven record and by testimony from our clients, the magazines engage readers and elicit response. Our magazines attract patients who might never have found you on the Internet. Some might have thought that with the advent of the Internet, print marketing would become obsolete, especially direct mail. This is not the case and we have found that done correctly, using the proven principles of scientific marketing, print marketing can even outdo the Internet in terms of bringing in qualified new patients. Internet marketing is necessary. Any practice, company or organization needs to have a good website. But Internet marketing does have its limitations. It relies on people looking for a product or a service and generally for the website to be visible on the first page of the dominant search engine’s (Google) results. You will miss people who are thinking about getting a product or service but haven’t acted on it yet, or who just simply missed clicking on your website. Of course, traditional print marketing has its drawbacks. Most print marketing arriving in mailboxes—coupons, brochures, postcards, etc.—gets little attention and is quickly tossed. There are many reasons for this, but it all boils down to a lack of scientific marketing, and a lack of an ability to grab the attention of the recipient. Our custom magazines achieve the opposite. They immediately attract attention and then engage the reader, motivating him or her to call or email the office. We offer 50,000 and 100,000 12-page and 16-page magazine packages. You will find our rates affordable and the ongoing costs similar to ordinary direct mail campaigns such as brochures and postcards. We also offer payment plans and financing advice. Call 855‑486‑2410 or email us for more information about how our custom magazine direct marketing program works and for a free marketing consultation. 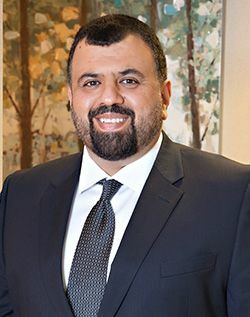 “We are now getting so many new patients from both that we know our initial investment (which at the time seemed like a lot of money) is small compared to the return we are already receiving and which will continue to grow. “Gilleard Dental Marketing is the best! All their employees are very professional and provide many different services from the creative directors, distribution personnel, internet marketing team and much more. “Operating a dental practice today without a Web presence is certain to spell disaster. I can remember back to first getting into dentistry and the only dentists that advertised were looked upon as kind of a shady type of practice. Today it is all about who has a better website and how you are positioned in searches. “Back when I realized that I needed to have a website, I remember that I had two fellow CEREC trainers, both who were like mentors to me, that kept telling me about their marketing and how successful their websites were. When it came time for me to look at getting one for my practice, the surprising thing was that they were both using the same company, Gilleard Dental Marketing! Remember, this was 5-6 years ago and there were already hundreds of companies doing websites, so not too surprising that two very successful practices were using the same website developer. “Keith and Deborah Gilleard, the principals of Gilleard Dental Marketing, have developed a powerhouse marketing company for dentists. Unlike many other companies, their personalization and customization make each site unique, not the cookie cutter approach that you often see. I remember the process of what we wanted to include in our site and the hours of personalization of the content to make our site “ours”. I remember the $$ and time that we were putting into this project, but looking back I can only tell you it was a drop in the bucket on the dollars that I generate from our web traffic. Beware of trying to save money in what today is one of the largest drivers of patients to our practice. I would have also missed another money making opportunity that they developed. “A year or so after doing the website, my mentor Joel said that he was doing this ‘magazine’ with Keith and that I needed to look into it. Well I looked at it but about a year later, and again it was pure genius! Again it was a substantial investment, but when you look at the ROI on this project, the first 5 patients that came from my Overland Park Dentist magazine paid for the entire cost. It continues to be a big source of new patients and those seeking our services. The best part is I have an exclusive for my area. I have never seen another marketing piece like this. This magazine has been absolutely amazing in the response it created from both existing and new patients alike. It has created for us the ‘expert status’ necessary to attract patients for the procedures we most desire to perform. “I have been working with Gilleard Dental Marketing for the past several years, after being referred to them by a former mentor. Having had two prior websites for my dental practice which were rather nonproductive, expectations for the new website were lukewarm. But then, Keith and his team set to work surveying my patients and interviewing me about the practice. In addition, Keith himself flew out to New Jersey to photograph my dental practice; our team in action as well as a number of our patients. Using all the information they had gathered and Keith’s amazing photographs, our new website was developed. “The end result was that this website far exceeded our expectations and has been by far the most productive marketing investment in my 30 year career. In addition to developing this website, the Gilleard Dental Marketing group has been responsible for the website’s SEO and Pay-Per-Click program. As a result of their efforts, our message has reached a number of prospective patients and has resulted in a steady stream of new patient emails and phone calls. In addition, the tracking provided by Gilleard has been helpful in determining the development of our marketing efforts. “More recently, having established a sense of trust for Gilleard’s marketing expertise, we decided to proceed with the production of a magazine which highlights our office and the procedures which we provide. This magazine has been absolutely amazing in the response created from both existing and new patients alike. It has created for us the ‘expert status’ necessary to attract patients for the procedures which we most desire to perform. Along with our website, this advertising piece has been by far the most successful of my entire career. 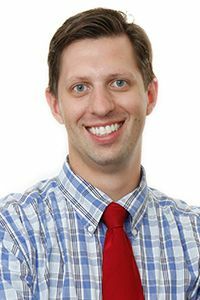 “I highly recommend the entire Gilleard team to any dental office that seeks to enjoy a successful marketing campaign. Their level of creativity, expertise and experience has resulted in a most productive investment for our dental practice. In our first year with Gilleard we grew our practice 27%. In our second year we grew 39%. We reached our capacity of 10 operatories in 2 years. No other marketing has given us near the same ROI! “In 2011 our practice was in its 6th year and we were operating in 7 of 10 potential operatories. We decided to look at external marketing to grow our practice. Doing Internet searches we stumbled across a website that was created by Gilleard. We were impressed so we gave them a call. Dr. Gray’s practice, McCalla Dental, has been receiving phone calls on the order of 200-400+ per month from this magazine issue alone. “I have been using the Gilleard Dental Marketing program for about a decade. I do all aspects of their program. We are a private practice and do not participate in ANY insurance networks. “We get between 80-100 new inbound patient calls per week. We have a 3 to 4 week waiting list for new patients to get into our office (all of them knowing we are out-of-network). Gilleard Marketing is not your normal marketing company. These guys have done major research into the prospective patient pools and have isolated an exact understanding of what patients are looking for. Our patients come in many times after seeing other doctors and knowing a little bit of what they need. They come to OUR office to get the work done after reading the marketing from Gilleard, and we just need to recommend the treatment and work out the payment details. I have had more quality large cases come in ready to do treatment with this magazine dollar for dollar than any other form of marketing that I’ve ever used. “I learned about Gilleard Dental Marketing by word of mouth about one year ago. Since that time the magazine they put together for me has been the most cost effective marketing tool I’ve ever used. “I’ve had more quality large cases come in ready to do treatment with this magazine dollar for dollar than any other form of marketing that I’ve ever used. “Gilleard Dental Marketing does the best job at bringing in large cases that I have seen in the dental industry. We have been working with Gilleard in multiple locations for a few years now, and the results are predictable and consistent. “We will continue to use Gilleard in any future endeavor and we consider it one of our top keys to success.